The Swans dominated but missed a first-half penalty as Oli McBurnie saw his spot-kick saved by Remi Matthews. Bolton's Craig Noone was sent off for a second booking before the break and, in the second half, the visitors were down to nine men as captain David Wheater was red-carded for bringing down Wayne Routledge as he looked to have a clear run at goal. Swansea cranked up the pressure in the closing stages and eventually broke Bolton's admirable resistance as McBurnie pounced from close range before substitute Bersant Celina swept in a third in added time. Victory lifts the home side up to 13th in the Championship - seven points away from the play-off places - while Bolton remain 23rd, seven points adrift of safety. Bolton's position is a precarious one, but their circumstances off the field have been even worse lately. Their playing and non-playing staff were not paid in February, a proposed takeover of the club is taking longer than expected and Greater Manchester Police have been in negotiations with the club over money owed for policing matches. It all made for a chaotic backdrop to this fixture, and Phil Parkinson's side looked braced for a long afternoon as they spent the 90 minutes almost entirely in their own half. 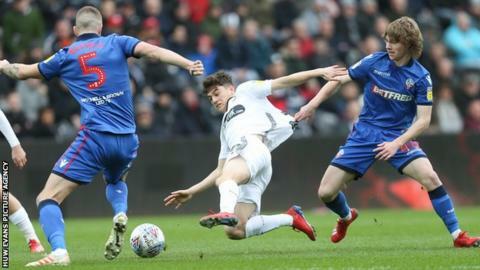 Swansea seized control with Matt Grimes and George Byers dictating from their deep-lying playmaking roles in midfield and winger Dan James threatening with his pace. Grimes, James and McBurnie all had early efforts on goal before Nathan Dyer made his way into the Bolton box, where he was brought down by Noone, prompting referee Gavin Ward to point to the spot. McBurnie struck his penalty firmly but too close to Matthews, who pushed the ball away to safety, making it two misses from five spot-kicks for the Swansea striker this season. Bolton were buoyed by their reprieve but, five minutes later, they were reduced to 10 men as former Cardiff City winger Noone was shown a second yellow card for a foul on McBurnie. While the sending off did not drastically alter the pattern of play, it intensified the pressure Bolton were having to withstand - and they did so admirably, even after Wheater's red card. The visitors dropped deeper to guard against Swansea's pace in attack, and it proved an effective tactic as the home side were frustrated in their search for a breakthrough. It eventually came in the 80th minute as substitute Courtney Baker-Richardson nodded a loose ball into the path of McBurnie, who poked in at the near post. The relief was palpable and then, in added time, Swansea sealed victory as James led a counter-attack and squared the ball to Celina, who confidently struck the ball into the top corner. "They made it hard for us… But in the end we managed to find a way, to find the solution. Credit to the players because it is not easy and I thought their focus and concentration was of a real good level. "They showed understanding as well because a team going down to 10 men does not necessarily give you an advantage in the key areas of the pitch. "We had to overcome that but if you look over the 90 minutes we deserved the win, and I am really pleased for the players who put a lot of work in." "The first sending off is a bad decision by the referee. Craig has gone into a challenge to block the ball in the middle of the pitch, and I'm not sure how you can tackle any fairer than that. "If those tackles are yellow cards, then we may as well rule out tackling all together in professional football. "The second one is a straight red card even though David is a long way from goal he is the last man. "Even when we had 10 men I felt comfortable, I didn't think they were threatening us that much. "But when you go down to nine men it is always going to be difficult because Swansea have some really good players." Match ends, Swansea City 2, Bolton Wanderers 0. Second Half ends, Swansea City 2, Bolton Wanderers 0. Jack Hobbs (Bolton Wanderers) wins a free kick in the defensive half. Jay Fulton (Swansea City) is shown the yellow card for a bad foul. Goal! Swansea City 2, Bolton Wanderers 0. Bersant Celina (Swansea City) right footed shot from the centre of the box to the top right corner. Assisted by Daniel James following a fast break. Attempt saved. Matt Grimes (Swansea City) right footed shot from outside the box is saved in the bottom left corner. Assisted by Mike van der Hoorn. Attempt saved. Wayne Routledge (Swansea City) right footed shot from the left side of the box is saved in the centre of the goal. Assisted by Oliver McBurnie with a through ball. Hand ball by Sammy Ameobi (Bolton Wanderers). Substitution, Swansea City. Jay Fulton replaces Nathan Dyer. Attempt missed. Daniel James (Swansea City) right footed shot from the right side of the box is close, but misses to the left. Assisted by Mike van der Hoorn. Attempt saved. Courtney Baker-Richardson (Swansea City) right footed shot from the centre of the box is saved in the centre of the goal. Assisted by Daniel James. Goal! Swansea City 1, Bolton Wanderers 0. Oliver McBurnie (Swansea City) right footed shot from the centre of the box to the bottom right corner. Assisted by Courtney Baker-Richardson with a headed pass. Hand ball by Courtney Baker-Richardson (Swansea City). Attempt saved. Nathan Dyer (Swansea City) right footed shot from the left side of the box is saved in the centre of the goal. Assisted by Matt Grimes. Substitution, Swansea City. Courtney Baker-Richardson replaces Connor Roberts. Substitution, Bolton Wanderers. Jack Hobbs replaces Clayton Donaldson. Corner, Swansea City. Conceded by Callum Connolly. Attempt blocked. Bersant Celina (Swansea City) right footed shot from outside the box is blocked. Assisted by Mike van der Hoorn. David Wheater (Bolton Wanderers) is shown the red card. Substitution, Bolton Wanderers. Luke Murphy replaces Luca Connell. Substitution, Swansea City. Bersant Celina replaces George Byers. Attempt missed. Oliver McBurnie (Swansea City) header from the centre of the box misses to the right. Assisted by Daniel James. Attempt missed. Matt Grimes (Swansea City) left footed shot from outside the box is too high. Assisted by Connor Roberts. Attempt missed. Daniel James (Swansea City) left footed shot from outside the box is too high. Assisted by Oliver McBurnie. Delay in match Clayton Donaldson (Bolton Wanderers) because of an injury. Corner, Swansea City. Conceded by David Wheater. Attempt blocked. Oliver McBurnie (Swansea City) right footed shot from the centre of the box is blocked. Assisted by Matt Grimes. Attempt missed. Matt Grimes (Swansea City) left footed shot from outside the box misses to the right. Attempt saved. Luca Connell (Bolton Wanderers) left footed shot from outside the box is saved in the centre of the goal. Substitution, Bolton Wanderers. William Buckley replaces Josh Magennis because of an injury. Delay in match Josh Magennis (Bolton Wanderers) because of an injury.